Sunseeker International announced that exceptionally high levels of interest in its ground-breaking new three-cabin Predator 57 have led the model to become the brand’s fastest selling yacht to date. The luxury performance motoryacht manufacturer has already reached the milestone of 50 retail orders for the model since the Predator 57’s launch at the CWM FX London Boat Show earlier this year, with forward orders secured for the next 18 months. Sleek and sporty, the design of this revolutionary model perfectly balances style with practicality and is yet another demonstration of the continual investment made in genuine new model development. The introduction of an innovative electric door between the saloon area and the cockpit is a first for Sunseeker and eliminates the need for sport yacht owners to choose between an ‘open’ or ‘closed’ option. Unique to this model, the door creates a seamless inside/outside entertaining area from the forward helm right through to the bathing platform. The cleverly engineered mechanism allows the door to open conventionally, but also lower itself into the sole, allowing those onboard to take advantage of uninterrupted views. The open-plan design is further enhanced by the addition of a fully opening hardtop roof as standard. The moulded aft cockpit offers the ideal backdrop for entertaining thanks to its large L-shaped seating arrangement and wet bar area. The addition of a barbecue and cool plate, make the aft cockpit the perfect spot to relax, unwind and enjoy the open air whilst the spacious deck saloon makes an equally idyllic setting for entertaining guests in opulent luxury. The interior is just as impressive, with a combination of fine materials and large opening portholes ensuring the full-beam master stateroom, which comes with a generous en suite, achieves the perfect blend of comfort and elegance. 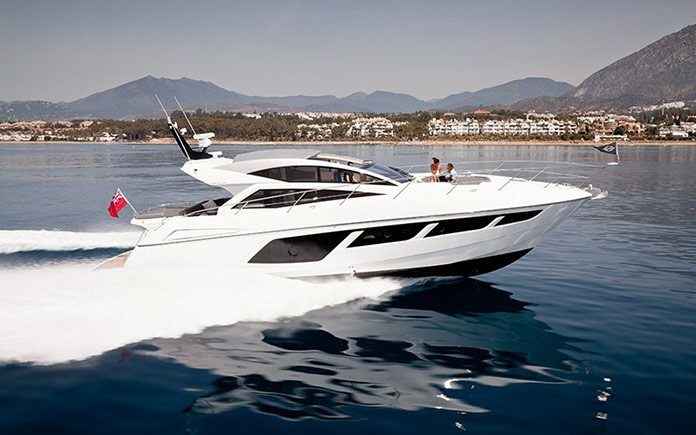 The forward VIP cabin exudes a light yet luxurious feel and further exemplifies the extremely high standards Sunseeker is so well known for. An optional third en suite is available for the bunk cabin, in lieu of the standard lower dinette. 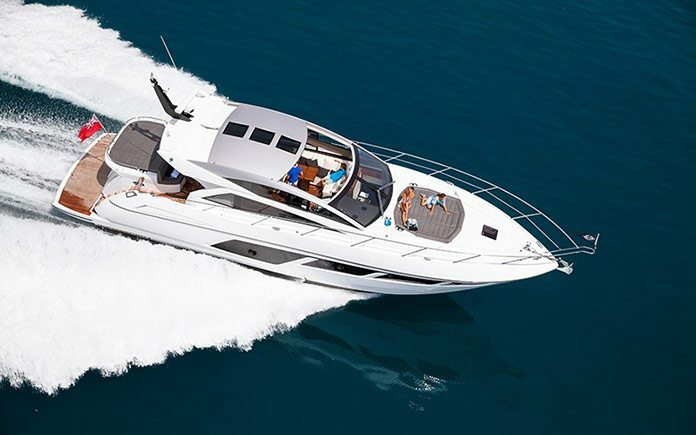 When it comes to performance, the new Predator 57 also cuts an impressive figure on the open water, with speeds of up to 37 knots depending on the engine/drive configuration chosen; both shaft drive and IPS options are available.